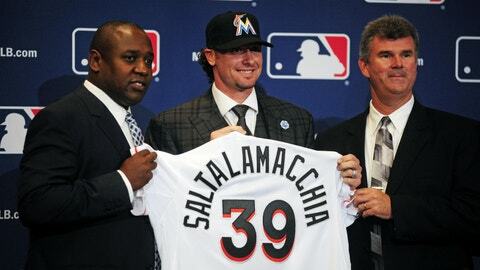 Jarrod Saltalamacchia (center) was one of three free-agent signings so far this offseason for the Miami Marlins. Though the winter meetings took place in a warm setting, the Miami Marlins made a flurry of moves to bolster their roster for the 2014 season. Even before all 30 clubs convened in Lake Buena Vista, Fla., the Marlins had already signed free agents Jarrod Saltalamacchia and Rafael Furcal. Both add veteran presence and postseason experience to a youthful lineup. Saltalamacchia fills a void at catcher, while Furcal solves the leadoff spot. When Miami’s front office and coaching staff discussed ways to improve a 62-100 team, there was one common thread: find consistent, proven bats without losing its inventory of starting pitching. The Marlins have been able to do that so far this offseason. "Our expectation was to get everything done," said Michael Hill, president of baseball operations. "We still have work to do. Are we pleased that we were able to do some of the things we were able to do? Definitely. We’re definitely pleased that we were able to do some things that we accomplished. But we still need to do more. "We’re not going to be rushed to make any decisions that don’t make sense to us. So we’re in no rush. We’re in no hurry. I think we’ve done a lot to re-shape our roster and prepare us for 2014. Are we finished? No. But I think we’ve changed the look of this roster from 2013 and added pieces that will help us win more games." The Marlins lost two right-handers from the back end of the bullpen: Chad Qualls (Astros) and Ryan Webb (Orioles). Miami acquired 23-year-old righty Carter Capps from the Mariners in exchange for Logan Morrison, who has been limited over the past few seasons because of two knee surgeries. Capps’ fastball can reach 100 mph, but he surrendered 12 home runs and posted a 5.49 ERA in his first full Major League season. Expect homegrown guys like right-hander AJ Ramos to fill key roles. The 27-year-old went 3-4 with a 3.15 ERA over 80 innings, leading rookie relievers in most statistical categories. "I have a lot of confidence in him," Marlins manager Mike Redmond said of Ramos. "He did a great job for a young guy. We pitched him in a lot of different situations. We pitched him early. We pitched him late. And definitely he’s going to get that opportunity to come in and pitch. "Where we put him, where he fits, we’ll wait to see. But I feel really comfortable with what can he do. I have a lot of confidence in him. He can get righties and lefties out. And really has the mentality and the stuff to be able to pitch at any point in the game." By signing first baseman Garrett Jones, the Marlins added another experienced and proven bat to the lineup as protection for slugger Giancarlo Stanton. Jones played in the postseason this past year for the Pirates, hitting .233 with 15 home runs and 51 RBIs over 144 games. The 32-year-old averaged 149 games during four seasons in Pittsburgh. Leaving out the enigma at third base, the projected Miami batting order features two switch hitters (Saltalamacchia, Furcal), two lefties (Jones, Christian Yelich) and three righties (Stanton, Marcell Ozuna and Adeiny Hechavarria). After all these moves, the final piece to the puzzle remains the hot corner. Last season, the Marlins signed veteran Placido Polanco to a one-year deal following an injury-plagued 2012. The gamble didn’t pay off, as the light-hitting 38-year-old batted .260 with one home run and 23 RBI over 118 games. A stopgap is a possibility as Miami waits for 2013 first-round pick Colin Moran to develop. "I would say for us, yes," Hill said of third base being the highest priority. "We wanted to inject some speed into our lineup, and we’ve been able to do that with Furcal. Outfield play, we feel very comfortable with the outfielders with have going into spring training … As you look at our ballclub, the only area where you don’t have a true answer is third base." If the Marlins decide to pursue a free agent, they freed up extra money by trading two arbitration-eligible players: Morrison and Justin Ruggiano (to the Cubs for Brian Bogusevic). Internal candidates include Donovan Solano, Ed Lucas and Derek Dietrich. On Wednesday, Redmond said Solano would be used in a "super utility" role because of his ability to play both the outfield and infield. Lucas can play all infield positions, including first, and the outfield. He is also the team’s emergency catcher. Dietrich, who was sent to Miami from Tampa for Yunel Escobar, earned his call-up May 8 when Solano went to the disabled list with an injury. Before struggling and being sent down, the 24-year-old hit .214 with 10 doubles, three triples, nine home runs and 23 RBI in 57 games. Dietrich struck out 56 times while walking 11. "I think we’ll see Dietrich in spring training come in at third base and get a chance to play a little more third base," Redmond said. "I think we all envisioned him as a third baseman. He did a great job at second. We know he can do that. We know he can play shortstop as well. "This year we’ll bring him into spring training and see how he does at third base. We like his power. We like his bat. And it’s just a matter of trying to figure out where he fits the best on the team."